8 oz. size shown for reference. 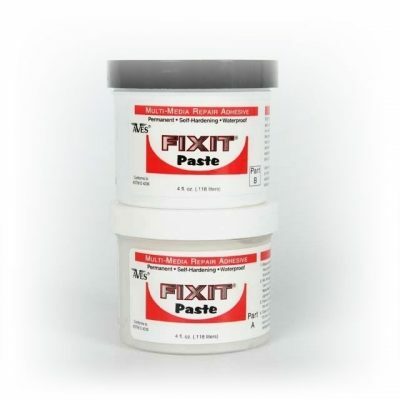 Fixit® Paste an industrial strength adhesive used to permanently repair, bond, cast & seal most anything! Self-leveling, batter consistency is stir-able and can be spread thick or thin for a durable surface coating. Tint with pigments to create or match desired color. 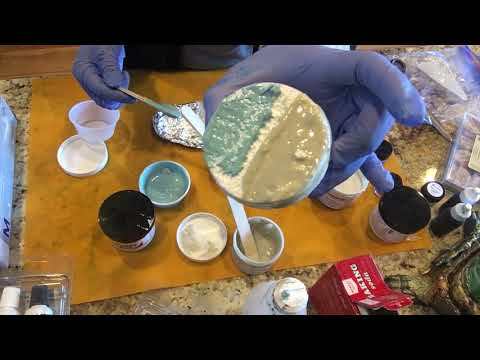 Great alternative to fiberglass & other casting resins. Cures to a rock hard, semi-gloss finish that can be sanded, drilled, machined or painted. Automotive & Marine applications; stands up to UV rays, impervious to water, fuels & chemicals. Tackle your toughest repair jobs! 1 fl. oz., 8 fl. oz., 32 fl. oz. Easy to use: Mix equal parts, add pigment if you like, apply, smooth & let cure. Adheres to: Itself (in any stage of set-up before or after curing), other epoxies, metals, wood, most plastics, PVC, ceramic, fiber glass, concrete & more. Measure equal parts of A & B. Using a craft stick & disposable surface/cup, mix vigorously 2 minutes until thoroughly combined. Incomplete mixing will give poor results. Working time 1-3 hrs. Optional: mixed paste may be tinted with paint or pigment. (A little pigment goes a long ways). Wear protective gloves [e.g., nitrile or equivalent] when combining parts A and B. Wear a dust mask and safety glasses when sanding cured product…[P280] *Keep out of reach of children…[P102] *Safe for adults when used as directed. 24 hr full cure is required for hard finishing purposes such as sanding, carving, drilling, machining, etc. Keep containers sealed when not in use. Conforms to Safety Standard ASTM International D4236. Many industry applications; as an adhesive for mending & filling; alterations; model making; prototypes, casting/molds, customizing, fabricating, sealing, or smoothing surfaces; apply to porous & non-porous materials to add texture, or a hard, durable shell (paste does not eat foam). Arts & crafts; antique restorations; home, toy, doll, and ceramic repairs; glass art; jewelry; stone setting; outdoor projects; interior/exterior auto & marine applications; water tanks; fountain, pool & plumbing repiars; patch holes & cracks, seal leaks; (safe to use with potable water, non-conductive). 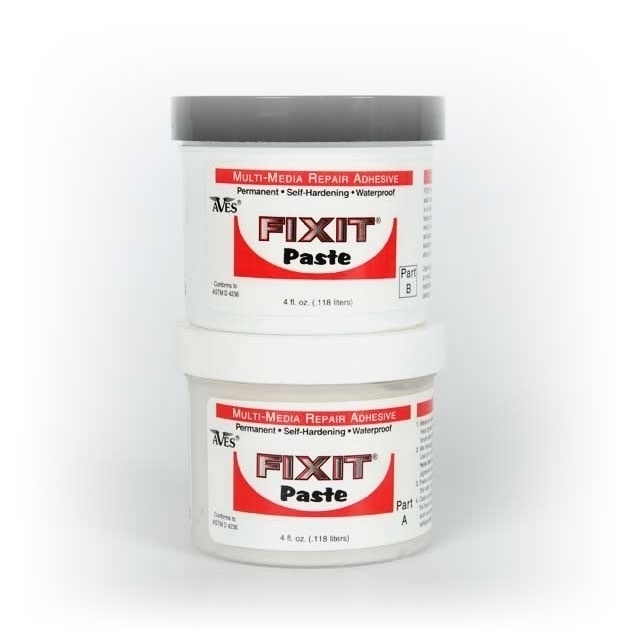 FIXIT® Paste is a safe alternative to fiberglass & other casting resins, works great with flexible molds! Can be tinted with pigments to match or create a desired color; note that adding pigments can alter products original consistency. Press materials such as grit, stones/glass, or tiles into mixed surface for additional effects. Smoothes and cleans up easily with Aves® Safety Solvent. FIXIT® Paste self-hardens with a working time of 1-3 hours, set time is 6 hours, 24 hour full cure. Sand, drill, grind, machine and paint to finish if desired. *Fixit Paste® can be tinted with paints or colorants while mixing to match or create a desired color. Smooths and cleans up really easily with Aves® Safety Solvent. All service persons who carry a tool box need to carry FIXIT® Paste for emergency repairs!